Thousands of Ghanaians appear to have been forced to find shelter in kiosks by the harsh economic conditions in the country. In urban cities like Accra, slums are growing by the minute, becoming affordable havens for the lower class. 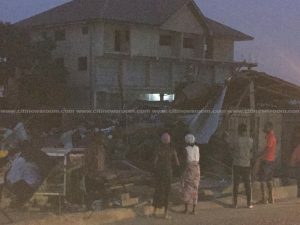 At Spintex, one of the busiest parts of the capital, several of such shanty towns, which have become known as ‘Kiosk estates” are commonplace. Considering the many factories, companies and commercial entities in the area, there is a high demand for cheap labour. At ‘Equator’, one of the slums in the area, a vast majority of the people living there work as factory hands for such companies. Due to the extremely meager salaries they receive monthly, they are unable to afford a regular home and have to make do with living in the kiosks. 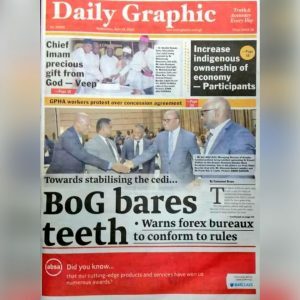 Kofi Agbemela, a 49-year-old who has lived in a kiosk at ‘Equator’ for 12 years said his low-income level had forced him to settle in the kiosk. “I don’t think anyone will be happy living in the kiosk. My salary is less than 300 cedis. So if you look at the salary, you cannot go and rent a room. You will not even go and ask for the price of a room,” he said. The problems of the slum dwellers have been compounded by the very area they live in. With Spintex being a prime location for high-end residential facilities and estates, the average cost for renting a room or purchasing a house might be beyond the average slum dweller. That, coupled with the now customary request of at least 2 years rent advance, makes it wholly unsurprising that a slum dweller like ‘Dealer’ would be forced to live in his small and barely-ventilated kiosk. “Nobody is happy with the situation here but it happens that sometimes where life puts you, that is where you will be. You have no option. It happens that us being at this side, government is not looking at us at all. When it is time for elections, MPs, ministers come around and say ‘vote for me’ and make a lot of promises but after the elections they know you no more,” he lamented. 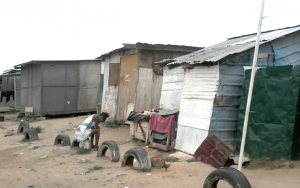 The post Spintex slum dwellers call for more affordable housing [Video] appeared first on Citi Newsroom.